I can’t believe Abby has turned one! Her momma contacted me with dreams of putting together a boho floral cake smash to celebrate this sweet girl’s first birthday. Pulling a few fun accessories from my stash, and adding to that a new princess net tent and some fun floral accents created the perfect bohemian floral backdrop for this cutie’s cask smash session. We started in her lovely little dress - which matched the decor perfectly. Then it was time to get to that cake! She was hesitant at first, but pretty soon Abby was totally into it, and enjoying all the sweet, sticky goodness! Cake smash sessions are kind of my favorite thing! I love putting together cute accessories, and getting to enjoy the babies in their adorable outfits. 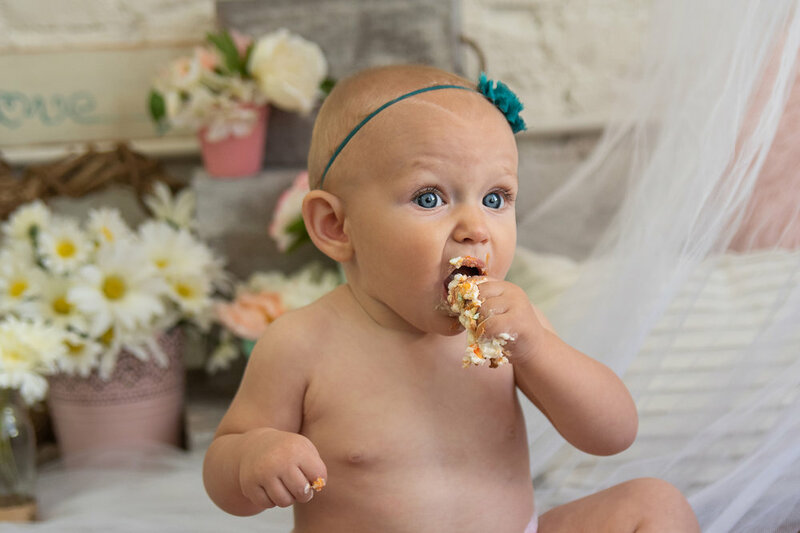 About half of the time babies aren’t too thrilled with the cake… it seems impossible, I know. But they don’t like the texture or taste perhaps, or they’ve just entered the “stranger danger” stage and they don’t want to have anything to do with me, or my scary camera…. but not Abby. She was all smiles and it was so much fun getting to spend this evening with her and your family while we created these adorable images!